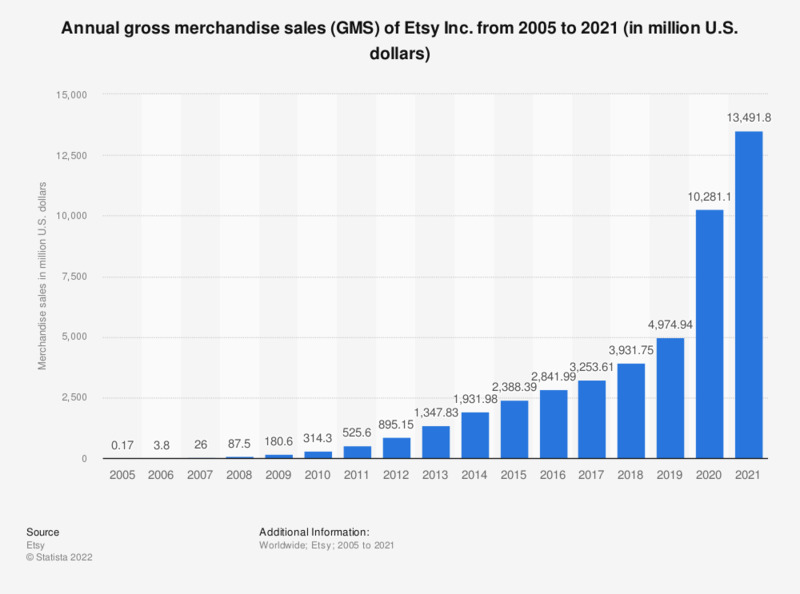 This statistic represents Etsy's annual merchandise sales volume from 2005 to 2018. In 2010, the e-commerce website specializing in craft and vintage items sold 314.3 million U.S. dollars worth of goods. In 2018, sales grew to more than 3.93 billion U.S. dollars. Etsy is an e-commerce platform that focuses on vintage or handmade items, as well as special wholesale items. Products cover a wide range of categories, such as photography, art, clothing, jewelry and many others. Etsy sellers have a personal storefront where they can list their items. Due to Etsy’s focus on micro-producers, the platform can be classified as C2C. As of December 2018, Etsy had more than 2 million active sellers. Only 18 percent of Etsy entrepreneurs were full-time sellers of creative goods on the platform. The majority of Etsy sellers saw their shops as businesses and aspired to increase their sales in future. In 2018, 55 percent of gross merchandise sales were generated via mobile. Etsy has a strong social network integration – it is a popular source of Pinterest pins and enables users to share and cross-post items to various social media.